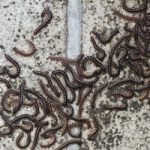 These long slender insects look like a worm with lots of legs–in fact the name millipede means “thousand feet.” There are many different millipede species and they can have anywhere from dozens to hundreds of legs. 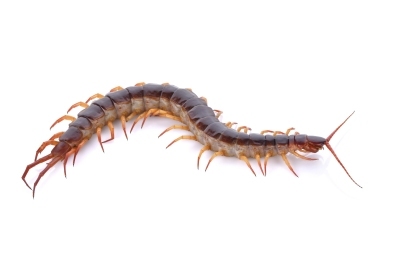 Despite their many legs they actually move pretty slowly compared to their cousin, the centipede. The most common pest millipede in South Carolina is the garden millipede. The garden millipede is grey/brown in color and grows to just under an inch long. Millipedes feed mostly on dead leaf and plant debris. They can be a problem in the garden when they attack seedlings and young tender plants. Their normal habitat includes moist areas around the outside of your house, under wood piles, rock piles, mulch, stepping stones, potted plants and other stored items near or against the house. Heavy rains will often drive millipedes inside. They migrate by the hundreds in search of better conditions when changes to their present environment make it less inhabitable. They are actually good climbers and can be found crawling up exterior and interior walls when migrating. There is no risk of being bitten by a millipede, unlike the centipede that can inflict a painful venomous bite. Be aware though, millipedes can emit a foul smelling defense fluid when handled or crushed. The fluid can cause an allergic reaction in some people and is a harmful irritant to the eyes. 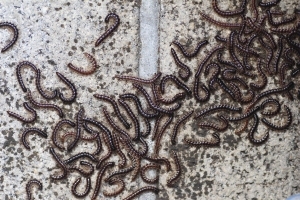 You may find dead millipedes piled up in corners of your home even if no pesticide was used. Millipedes need moisture to survive and will not live long under dry conditions. Centipedes are fast which comes in handy for these hunters that use their piercing jaws to kill and eat their insect prey. They have segmented bodies, usually with a pair of legs on each segment. They can vary in length from 1” to several inches and their long flattish bodies are yellow to brown in color. While their venomous bite is certainly deadly to the insects they hunt, their bite is simply painful for most children and adults, comparable to a wasp sting. “House Centipedes” can become firmly established in a home especially in areas of moisture like under sinks, around plumbing, in laundry areas and also where there is lots of storage. 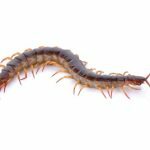 Centipede species usually found outdoors can also find their way indoors especially when there are large numbers of them around the foundation of a home, or when entry points have not been appropriately sealed. The Pest Force uses Integrated Pest Management techniques for these pests, using pesticides for initial reduction of numbers and working to eliminate the circumstances causing them to thrive or gain entry. These pests are covered under our Quarterly Pest Management Program.